Customizing this Personalized Locker Room Framed Wall Art is easy thanks to our simple customization process that allows you to be a valued part of the Los Angeles Angels' team. 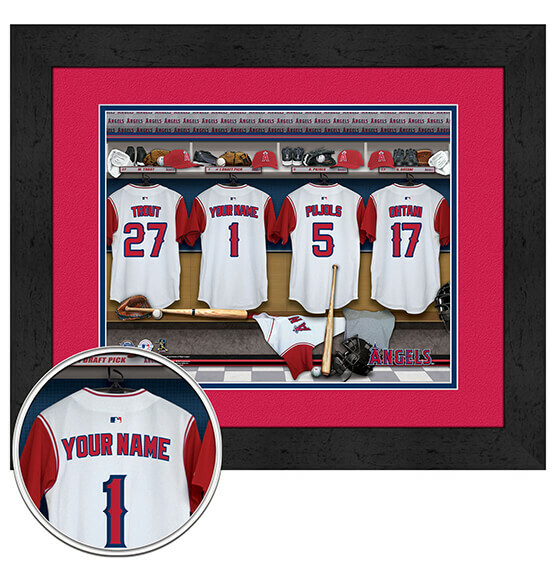 We'll add any name up to 12 letters to the back of an Angels' jersey in this charming locker room scene. This custom piece of sports decor makes a perfect gift for friends, family members or co-workers who are passionate about this truly historic baseball club. Our high-quality piece comes ready to hang with a sawtooth back piece for easy mounting. Slide into home base with this amazing gift that celebrates your devotion to the Los Angeles Angels!